Engines REVVING Up: Commodities In The END ZONE! We’re not just talking about the early movers (gold bugs), either. Smart money is shuffling their portfolio adjustments, and I am too. Today, I sold two major positions. The first is the largest European insurer, Allianz, which I bought for $16.16 close to four years ago. Making over 55% (including dividends) on one of the safest companies on the planet has been a wise decision. Remember, back in 2014, European stocks were depressed, as the entire continent was dealing with existential uncertainty. As you can see, the company began rallying a number of months ago, and I don’t expect any fireworks in the near future, so I’m selling and I’ll be rolling over these gains into commodities. The second position I took profits in is John Deere, the agricultural manufacturer, which is famous throughout America. It is becoming too popular, and I bought it right at the bottom, so it has earned over 100% in no-time. 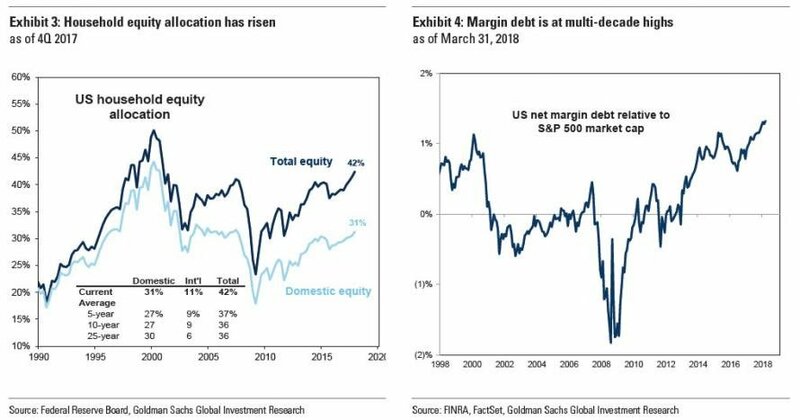 As you can see, it has outperformed the S&P 500, the Dow Jones, and the NASDAQ for the holding period, so it is attracting too much hedge-fund money and becoming too crowded – time to head for the exit. I have also liquidated my position in Munich RE, a global reinsurer, which Warren Buffett sold two years ago, missing out on some hefty gains. With combining the cash from these three, I’m as liquid as I’ve been throughout this cycle. I haven’t had so much cash set-aside since 2010. Nothing is hotter than the U.S. economy right now. President Trump was able to unleash, along with organic market forces, incredible untapped potential by deregulating and cutting taxes. This has put America on the launch pad. Examine this chart carefully. The numbers are indicating this economy is reaching peak potential. Quits: People make a conscious choice to fire their boss for one reason only – they have found a better one! The number of quits is at an all-time high right now. Americans smell opportunity, and they’re acting on it. Openings/Hires: This is actually an unbelievable stat because it is peculiar, yet Wealth Research Group has discussed it many times. 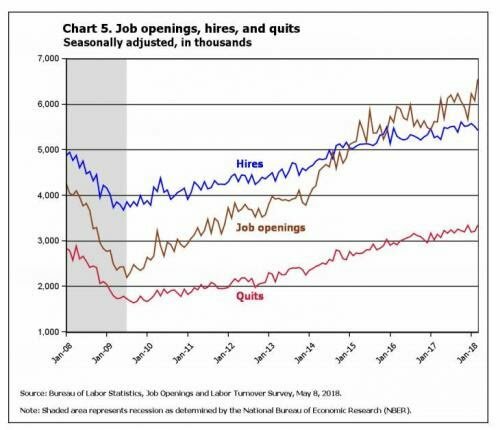 There are more openings than hiring. It is possible only due to the fact that skilled Baby Boomers are retiring, but Millennials aren’t skilled enough to replace them yet. In other words, in 2-5 years, Millennials are going to be making much more than today, as they become better trained. People are “enjoying” the wealth effect, which basically means that their speculative juices are coming out of the closet. Leverage is high for mom and pop right now, just as Bridgewater Associates, founded by $21B worth, Ray Dalio, is net short stocks. It’s amazing to think that nine years ago, when the time to make generationally enrichening moves in the stock market was open to anyone, everyday investors were hoarding cash, while nine years later, as stocks become popular and expensive, they want to own Netflix and Facebook, on margin, all of a sudden. The global economy, fueled by America’s organic growth, China’s credit easing, and the Middle-East’s oil crisis is exactly what a commodities speculator could hope for. I’m taking this mid-6-figure sum, which makes up my cash position, and starting this Sunday, I’m investing it in four companies in the next three months. The largest allocation will go to my three favorite ways to profit from the oil price surge. Expect full details this Sunday. CRITICAL DAY: Global Markets FROZEN and PARALYZED! GET PSYCHED-UP: Silver Is In The ZONE! Watch This Dormant Sector CATCH FIRE – HUGE ALERT!